I'm still kind of floating on air after the news of the accepted offer on our new home - it's been hard to think of anything else! Little by little I've been piecing together ideas of how we'll decorate the space and just how much work we have ahead of us. We've got the home inspection scheduled for tomorrow morning, which is just about the final stepping stone to actually calling this house ours. Who knows? The home inspection could go haywire and the entire place may crumble before our eyes - but the house looks to be very well-cared for, so I'm not expecting any wrenches been thrown in the inspection. Fingers crossed! 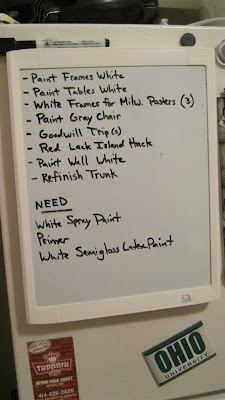 That list will give you the tiniest sneak peak of what we're envisioning in our home. I promise it's not going to be an all-white space, as all the "white paint" references allude to! And already it looks like we're able to cross one thing off the list! On Sunday, we tore through our closets to see what unnecessary items we could purge. If you know me at all, you know I have a tendency to hold on to things for a little too long. No, I'm not a hoarder (as Eric may tell you...), I just see the value in keeping certain items around for those "You never know when you might need it!" moments. (Actually.... I think I've actually heard almost every subject on "Hoarders" utter that exact phrase..... yikes). Youths across the nation exasperated their lungs trying to hold the last note of Coolio's "Gangsta's Paradise"
It's time that t-shirt find a new home. Because Eric has a Goodwill located close to his office, he's making trips to drop off the bags all this week. I can't tell you how amazing it feels to have so much room in my closets! It's definitely going to make our move much easier. 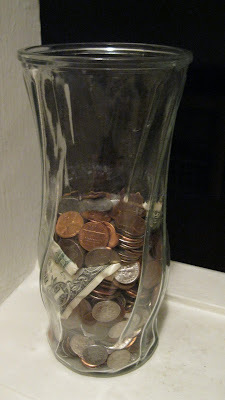 We've also started a "Furnishings Fund" jar, wherein we'll collect loose coins and dollar bills to save up for buying a new couch, rug, curtains, tables and odds and ends. Every penny counts when buying things for our first home! We only just contributed to the jar this morning, and look how much we've accumulated already! And on that note, while visiting Eric's mom over the weekend, she sent us back with some power tools, paint rollers and trays and a few garden tools for the house. She also offered to give us her outdoor patio set! I'd been looking at patio furniture online and was surprised at how expensive it is - anything in good condition that we can get for free is just an added bonus! So, there you have it: Our first steps and projects we're undertaking on the road to being homeowners. I'll be posting about projects frequently, so let me know if you have any questions or requests on what you'd like to see! And, of course, if you have any tips on making a smooth move, saving up for big purchases or anything else home-related, please let me know - I need all the help I can get at this point!